Bacon and potatoes sauteed with onion and white wine vinegar and mixed with rich Hellmann's® or Best Foods® Real Mayonnaise. The perfect, warm, satisfying German potato salad. 1 Cover potatoes with water in 4-qt. saucepot; bring to a boil over medium-high heat. Reduce heat and simmer 10 minutes or until potatoes are tender. Drain and cool slightly. 2 Cook bacon in large skillet over medium-high heat until crispy; remove and crumble. Reserve drippings. Add onion to reserved drippings and cook over medium heat, stirring occasionally, until tender. Stir in vinegar, water and sugar. Bring to a boil over high heat. Reduce heat to medium, then add potatoes and chives; toss gently. Cook until liquid is evaporated, about 2 minutes. Remove from heat. 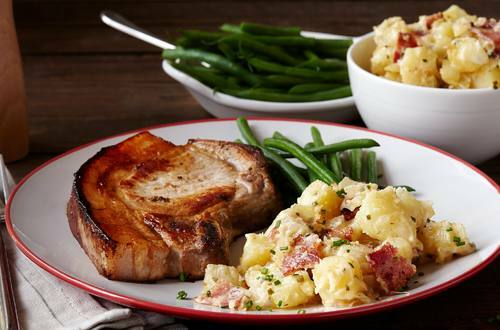 Stir in bacon and Hellmann's® or Best Foods® Real Mayonnaise. Serve warm.